The E3SM project is approaching the end of the first year of the three-year E3SM version 1 simulation campaign. The E3SM simulation campaigns focus on three key earth system research areas: the water cycle, biogeochemistry, and the cryosphere. The water cycle campaign uses the E3SM configuration (version v1.0) designed to study water and energy cycles in the atmosphere, ocean, sea ice, land and river components. Version 1.0 addresses water cycle science questions of interest to the U.S. Department of Energy, including issues relating to water availability, water cycle extremes, and interactions between the water cycle and the rest of the human-earth system on local to global scales. This physical model also serves as a foundation for the two additional simulation campaign codes: a “biogeochemistry configuration” (version 1.1) with interactive nitrogen and phosphorous for studying interactions between biogeochemical cycles and other earth system components, and a “cryosphere configuration” (version 1.2) with added interactive ice-shelf cavities for assessing the impacts of ocean-ice shelf interactions on Antarctic Ice Sheet dynamics and the implications for sea level rise. High-resolution (25 km atmosphere and land, 18-6 km equator-pole ocean and sea ice) coupled water cycle simulation has now completed 38 of 50 years. The climate of the high resolution simulation looks reasonable. The companion 50 years of standard low-resolution run with exactly the same tuning are also complete. In the next quarter, the remaining 12 years of high-resolution run and the 1850 and 2010 configuration runs to test aerosol and climate sensitivity also should be complete. New low/standard-resolution (100 km atmosphere/land) atmosphere-only water cycle simulations complement the already completed DECK simulations. This includes two three-member ensembles that were conducted to compute the time-varying total effective radiative forcing (ERF) between 1870 and 2014, as well as the aerosol-cloud forcing (ERFari+aci). The biogeochemical (BGC) simulations use the lower/standard resolution configuration (100 km atmosphere/land, 30-60-~30 km equator-midlatitudes-poles ocean/sea-ice). The National Energy Research Scientific Computing Center (NERSC) is the primary scientific computing facility for the U.S. Department of Energy’s Office of Science. 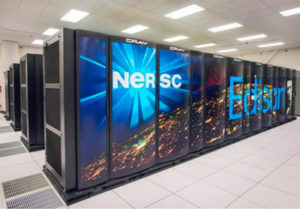 The E3SM project runs many of its simulations on Edison, a NERSC supercomputer, which is a Cray XC30 with a peak performance of 2.57 petaflops/sec, 134,064 compute cores, 357 terabytes of memory, and 7.56 petabytes of disk space. 1132 years of spin-up for three different model configurations are complete. The first configuration, E3SMv1.1-BGC, uses the Converging Trophic Cascade (CTC) approach to soil biogeochemistry and includes nitrogen and phosphorous limits on the carbon cycle (CNP); additionally, this configuration includes active biogeochemistry in the ocean and ice models. For this configuration, 679 years of spin-up were completed. The second configuration, E3SMv1.1-BGC-CN, also uses CTC, but excludes phosphorous limits. Fifty-six years of spin-up have been completed for this configuration. The final configuration, E3SMv1.1-BGC-ECA, uses an alternative approach to soil biogeochemistry – the Equilibrium Chemistry Approximation (ECA). For this configuration, 397 years of spin up are complete. Historical simulation (1850-2014) with transient CO2 concentrations, land use, non-CO2, and nitrogen deposition as specified by CMIP6 – 67 of 250 years have been completed. Ocean-sea-ice only simulations have been conducted for several decades at both low/standard and high resolution (~30 and ~10 km near Antarctic ice shelves, respectively), including heat and freshwater fluxes between the ocean and ice shelves, in order to investigate the importance of high spatial resolution on accurate simulation of sub-ice shelf melt rates. One set of low/standard-resolution pre-industrial (1850) fully coupled simulations have been conducted for about 75 years, both with and without heat and freshwater fluxes between the ice shelves and oceans, in order to better understand the broader impacts of explicitly resolved ice shelf melt fluxes on Southern Ocean high-latitude water mass transformation and regional and global ocean circulation. Low/standard-resolution simulations with improved liquid and solid Antarctic ice sheet fluxes to the ocean (explicit sub-ice shelf melting and data iceberg climatology) have been conducted for about 100 years to study the importance of improved treatments compared to more approximate treatments. Low/standard-resolution (30-60-~30 km), pre-industrial fully-coupled simulations with and without ice shelf cavities should start soon. 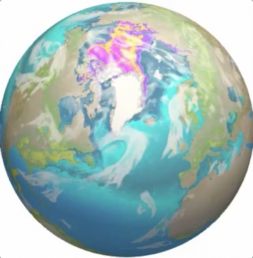 The component-sets were created and tested in support of the Cryosphere campaign’s fully coupled simulations. Find out more about the planned v1 simulation campaign on the “V1 Campaign” page.